Proof that I am not wasting all of my time looking at cat videos. The collection of short stories that we did for our NaNoWriMo workshop is live for download. Divide and Conquer Volume One is available now for FREE at Smashwords and is coming soon to other retailers. 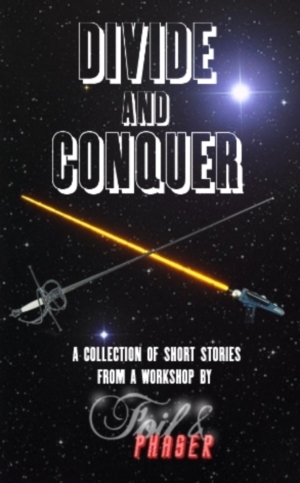 If you can’t wait or you hate Smashwords, you can get a copy from me directly at foilandphaser(at)gmail(dot)com (specify format), or you can always read them at Foil & Phaser as we are serializing the stories on the blog over the next few weeks. Just click on the Divide and Conquer link on the menu bar. Please show your support emerging authors and pick up a free copy today. Also, watch for a new workshop coming soon.